Hello, I'm Gregor and I put this site together. At first, you'll find an overview of recommended underbody underglow kits, followed by a public poll and a general buying guide on underbody underglow kit. 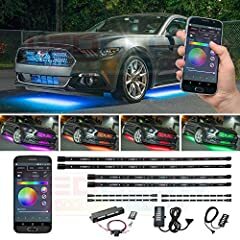 Further down on this page, we do link to other well-written articles and reviews about underbody underglow kits. At last, you'll be able to weight in your own opinion in the comments section. If you also want to vote on the best underbody underglow kit, click here to view the poll. 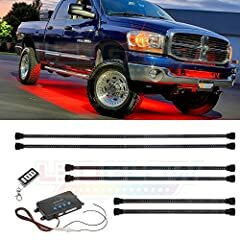 Underbody underglow lighting is LED lights that glow under any vehicle, be it truck, car, motorcycle, etc. 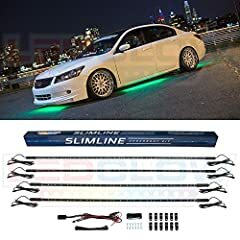 Typically affordable and easy to install, underbody underglow kits can be found in a variety of auto shops, hardware stores, and are commonly found online. In recent years people of all ages have been buying and installing the kits on their vehicles. They are a great accent to attach to anyone's vehicle who wants to personalize and make it seen more than the others on the road or other places. 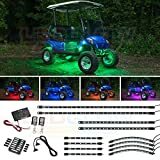 While each kit has the same purpose, to add underglow lights to a vehicle, some kits come with different accessories, light types, and have different ways of operating. This can affect the look and/or function of the lights. These things are all to be considered when shopping for a good kit or two, depending on the kind of appearance that is wanted. Here are some tips on how to chose the right lighting kits, installing them, and the difference between them and their functions. 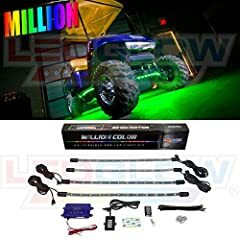 Underglow lighting can be controlled one of two ways: by Bluetooth connection on a phone or by remote/switch control. Each kit has instructions on how to control the lights with their Bluetooth apps. Some kits only operate with either android or ios systems, though most work with both. Bluetooth connection has been known to be a little finicky with some phones and even the lights themselves, but as with any product, other people have reported no such problems and have had nothing but a great experience using the product. For people who lose remotes often and prefer to use their phone for everything, this is the better choice. 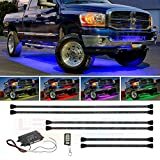 Remote controlled underglow lights are used by just that, a remote. Some are mounted onto the vehicle itself while others are wireless and powered by a battery. These remotes are small and pretty simple. If the lights are primarily one color with no extra settings, there will be very few buttons. The more colors and extras the kits have, the more buttons there will be. This is idle for people who want either just on and off button or many different buttons that can change the lights in over a dozen different ways. Pod underglow lights are individual LED lights, typically round or oval shaped, that are attached by round mounting pads. Pod lights can be Bluetooth activated or hooked up with wiring and a remote control. Pod lights are generally waterproof, shockproof, and durable against rocks and heat. Pod underglow lighting kits can contain 6 or more pods and additional wiring, if they're not Bluetooth controlled. Pods are great for people who don't want the obvious straight line that strip lights create. They add a more subtle, yet strong, glow that is seamlessly emitted underneath the vehicle. Underglow strip lights are tubing, generally slim polycarbonate, that contains multiple LED lights. The underglow strip lighting kits come with the strips, all wiring needed for installing, and the power supply and/or connector, usually 12V battery powered or a car cigarette adapter. The strip lights vary in size and thickness and most can bend at angles. Like the pod lights, the strip lights are waterproof and durable against the elements. Strip lights are used by those who want to wrap and maneuver in those lights in the corners and tight spots under their vehicle. The fact that they are small and flat enough to fit anywhere, yet shine so brightly is why they are so popular. Compared to the pods, the strips are more easily hidden and placed. Although, the tighter and more hidden the placement, the more awkward the installment could be. 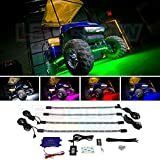 Regardless of the type of underglow lights, pod or strip, as well as controls, Bluetooth or remote, underglow lighting kits can come in a variety of colors. Some kits even have multi-colored lights, meaning there is more than one color option. This can be changed by the Bluetooth app or the remote control. The single color lights are ideal for those who are sure that one color is all they need. 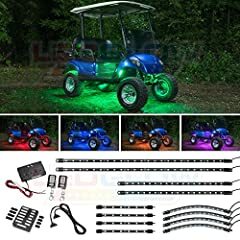 The multi-colored lights are the better option for people who can't seem to decide on a single color, or they want the ability to chose any color at any time without installing another kit. Some kits come with extra features besides just the simple on and off function. 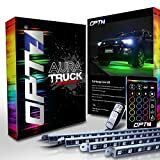 These features include music dancing, the light brightness fluctuating based on music beats and sounds, pre-programmable dimming and on/off functions, and strobe effects. Not all kits have these features. Some are simple and have none at all. When looking for kits that have extra features, it's important to look at the product details and possibly ask the seller if they have these features. These extras are great for those out there who want all of the bells and whistles. They stand out even more than others who have underglow kits installed. People love having a mini light show coming out from underneath their vehicle. These kits can be easy and safe to install when following the instructions. Most if not all of these kits are plug and play, meaning all you have to do is plug the lights into the cables and then the power source, and they're ready to light up and work. These are the best for people who want to get the job done quickly and easily. Some kits have different installation instructions but usually, consist of these several steps. The first being to pick the spots of application, where the lights are wanted. The second, optional, is to clean the area thoroughly for best mounting results. Then, mount the lights, and this is where the instructions can vary depending on the product. Next, the lights are plugged into the wiring and the power source. After that, all that's left is to turn on the lights. 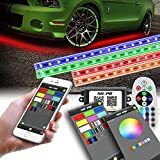 Knowing all that the different factors of each underbody underglow kit is necessary for choosing the best one. All that's needed is a little money, knowing what kind of lights are needed, and taking a few moments of installing them. This will make any vehicle pop and shine out on the road. New: Our editorial list of additional articles. 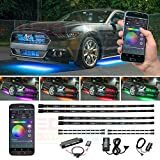 We decided to gather informartion all around the internet and present you a list of helpful, external links to interesting reads about the best underbody underglow kits and their reviews and guides. 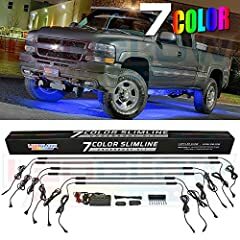 You're not convinced by the previous writings about underbody underglow kits? Of course you can just choose by visual impression, that's why we present you all our chosen products at a single glance. A click on any image is enough to open an external link to the best offer we could find. review of LEDGlow slimline Series. www.LEDGLOW.com. excellent product id recommend to anyone.. Finally, we want to present you our rating criteria for our underbody underglow kit comparison, so you can better understand and comprehend our recommendations and the rating process itself. 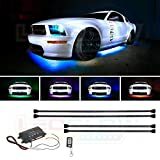 Furthermore, we still ask you to keep your eyes open for short term deals in order to make some great bargains with underbody underglow kit in 2019. Published by G. Krambs on StrawPoll.com (last update on 2019-04-23 08:06:04). 21 of 28 readers found this article helpful.